Our patients and their families and friends gathered Feb. 1 for a public viewing of the Gallery of Strength, an art show celebrating 34 patient-created works of art at the Emily Cooper Welty Expressive Therapy Center. The art show highlighted everything from acrylic paintings to digital creations. 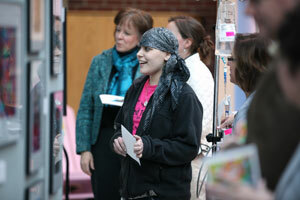 The patient art was created in the inpatient cancer and blood disorders unit at Akron Children’s Hospital. One year ago, Akron Children’s received a grant from the LiveStrong Foundation and the Creative Center for an artist-in-residence program. Emily Dennis, an art therapist and professional counselor from West Akron, spent nine hours a week at the hospital helping patients express themselves through the arts. She is also a doctoral student in Kent State University’s Counseling and Human Development Services Department. The exhibit marks the end of the year-long grant and also Emily’s tenure, one that she has enjoyed immensely. For Ethan Puhalsky, a 7 year old from Norton who is battling leukemia, art became a coping method for passing long days at the hospital. 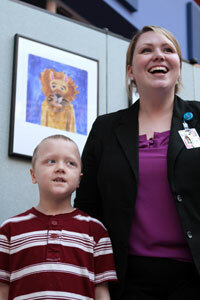 Ethan’s piece, Leon the Lion, was created during a 22-day hospital stint that included Christmas and New Year’s Day. The Gallery of Strength was made possible with generous support from LiveStrong, the Straughn Family and the Fairlawn Pat Catan’s Craft Centers.